S. 284 x 407 mm. Due to a misunderstanding in Vasari's Vite, this engraving was traditionally thought to be based on a composition by Baccio Bandinelli. However, it is very closely related to a drawing by Rosso Fiorentino in the Uffizi. A copy of the drawing, also in the Uffizi, has been attributed to the engraver Marco Dente. It shows how the printmarker developed and added to the composition prior to working on the plate. 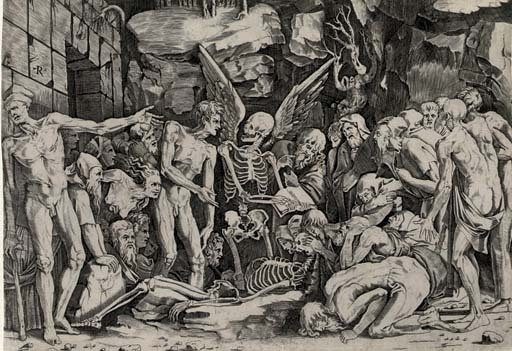 Rosso's drawing is dated 1517, which serves as the terminus post quem for this highly excentric print.